September 9th is National Teddy Bear Day! These cute little teddy bears are made completely out of marshmallows and cocoa powder so they are 100% edible! They are simple to make and perfect for a baby shower, get well treat or for gift giving. 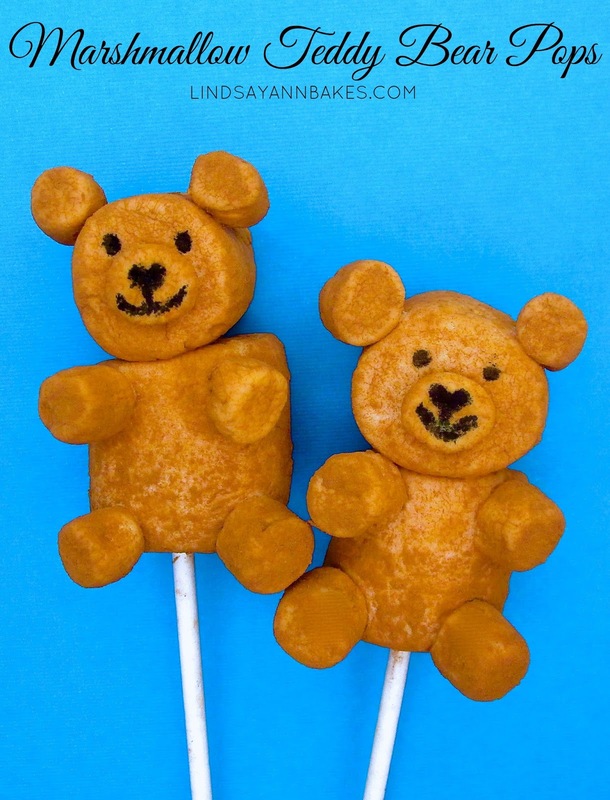 I used the same technique for these teddy pops as I did for my Valentine Teddy Marshmallow Pops, except I added a touch of cocoa to make them stand out. Push the lollipop stick all the way through the flat bottom of the first marshmallow and out the top, leaving an inch of stick above the top of the marshmallow. Take the second marshmallow and flip it on its side with the flat side facing forward. Push it through the stick on top of the first marshmallow, without piercing the stick through the top for the head. Using your melted chocolate, attach the mini marshmallows, flat side facing forward, to make ears, arms, and legs. Smash the last mini marshmallow with the flat ends between your thumb and index finger until flat, and attach it to the bottom of the face to form a snout. Let chocolate dry. Roll your teddy in cocoa powder until completely coated. If chocolate does not cover the entire bear you can dip the marshmallows in water and then coat until brown. Using your black edible ink pen, draw on a face. Your teddy bears are now ready for gift giving... or eating! Place a clear sandwich bag over the teddies and tie ribbon around the stick to seal. You can even create a display for your pops. To create a display that your pops can stand upright in, take a block of Styrofoam and wrap it in festive wrapping paper or tissue paper. Push the bottom of each stick into the styrofoam for guests to easily grab and enjoy.